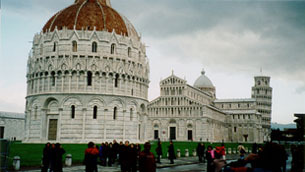 The Piazza dei Miracoli in Pisa. In the foreground is the slightly tilted Battistera. In the middle is the crooked duomo, and in the back is the famous leaning tower. 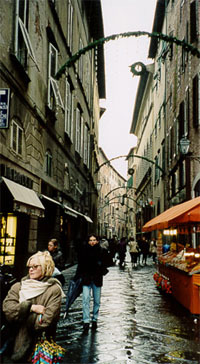 A street scene in Pisa. 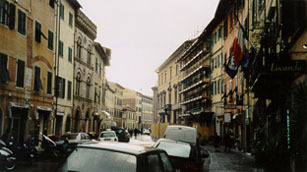 The streets in Pisa are much wider than those in Firenze or Lucca. We ate at a sandwich shop on this street before heading out to Lucca. 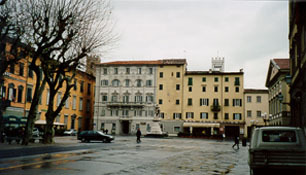 Another angle of the Piazza Napoleone in Lucca. 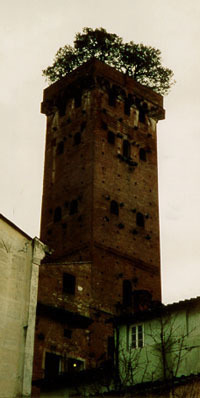 The Torre Guinigi in Lucca. Notice the trees growing on the roof of the tower. 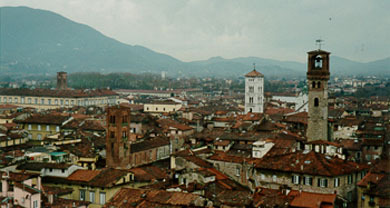 Irith and I took the picture above and to the right (Lucca's skyline) from there. 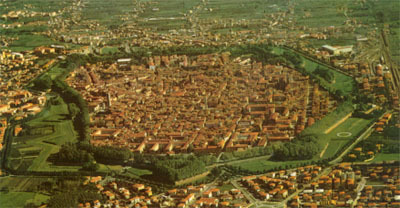 Lucca's skyline taken from the tower pictured to the left. These buildings were built into an old Roman anfiteatro as it began to deteriorate. 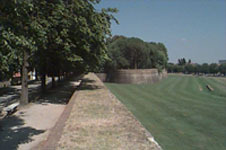 Lucca is completely fortified by tall, brick walls. On the inside, the walls are hills, upon which people run and walk their dogs. Notice the grass just outside of the city's walls. 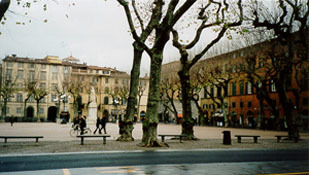 (Above) A street scene in Lucca. Notice how narrow the streets are. Firenze's streets are just as narrow, though I could not capture it as well as I did here. 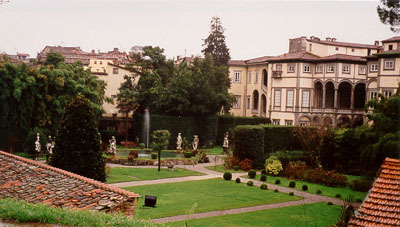 (Right) A picture taken from on top of Lucca's walls, looking into a museum and garden with sculptures. 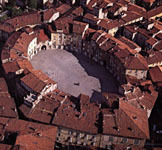 High above Lucca. Here you can see how the city is completely surrounded by its walls. Note: we did not take this picture or the two pictures directly above it.